The F-80 Hollow Cone Nozzles produce the finest possible breakup with direct pressure operation. No air or steam is required as the atomizing medium. While higher pressures produce finer droplet sizes, these Nozzles will operate satisfactorily on water at pressures of 40 PSI or more. 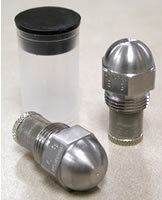 These nozzles are equipped with a 9/16"-24" machine thread for mounting in either single or multiple adaptors. Material: Brass and 416 Stainless Steel with 120 mesh Monel screen strainers. Also available in 303, 304 and 316. Spray Angles: 45°, 60°, 80° Sizes #3.0 to #9.5 available in 120°. All ratings are at 40 PSI. Adaptors: Brass or 416 Stainless Steel. 1/8" or 1/4" male or female NPT connections in Brass. Female NPT only in 416 Stainless Steel. Operating Pressure: Lbs. Per Square Inch.